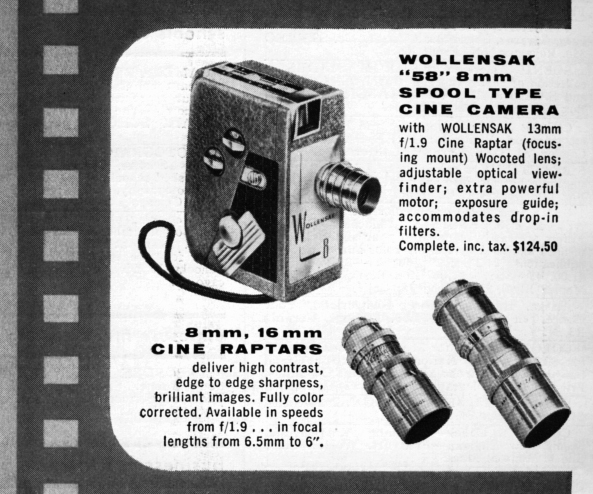 This is a listing of every important Revere and Wollensak movie camera of which I am aware. I am not going to list one-ofs, specialty, or minor variants. 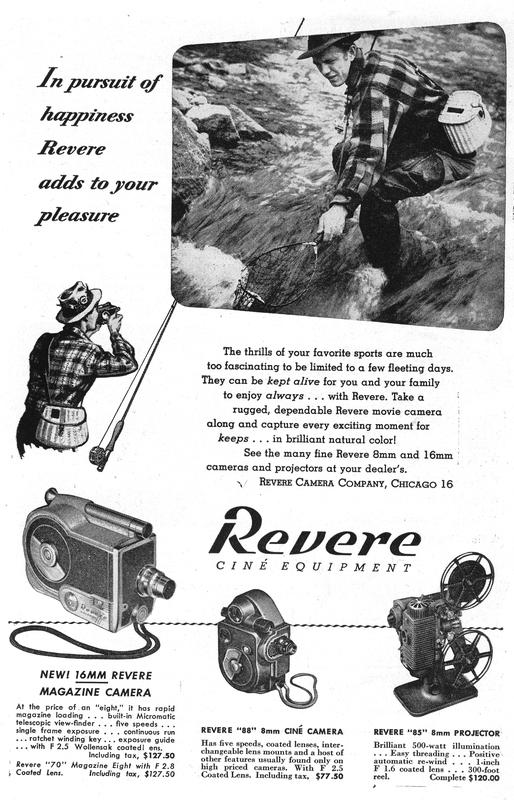 Revere Camera made movie cameras beginning around 194(tbd). 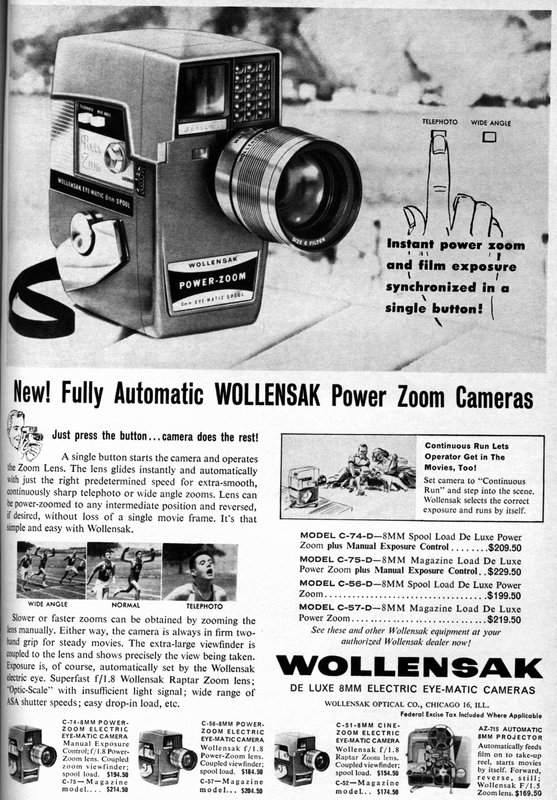 Wollensak-branded cameras appear around 1955. 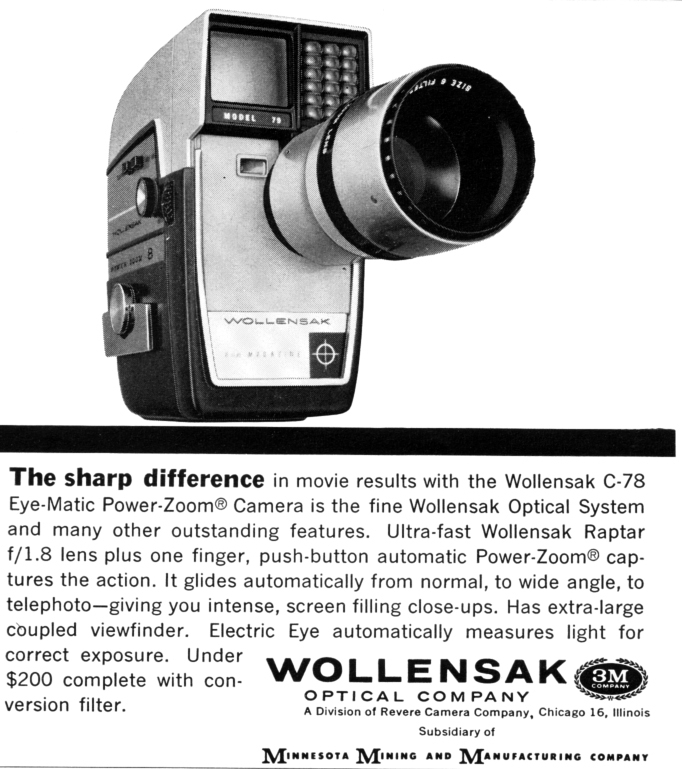 Both ended around 1963 after Revere/Wollensak was purchased by 3M. For more information, see my brief history of Revere/Wollensak. Cameras are listed roughly by model number, then by name. 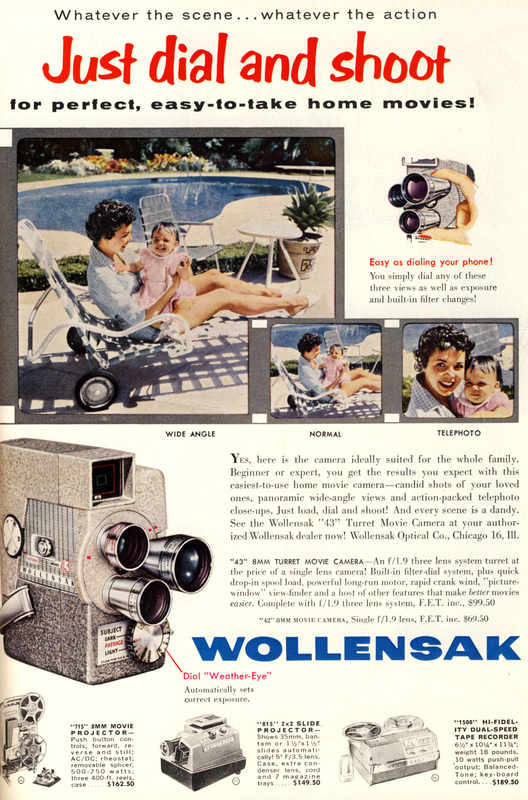 Make: Revere Camera purchased Wollensak Optical and used the name as a product line concurrent with Revere's. Model: Model names with links go to a separate web page on this site; it means that I have this camera in my collection. 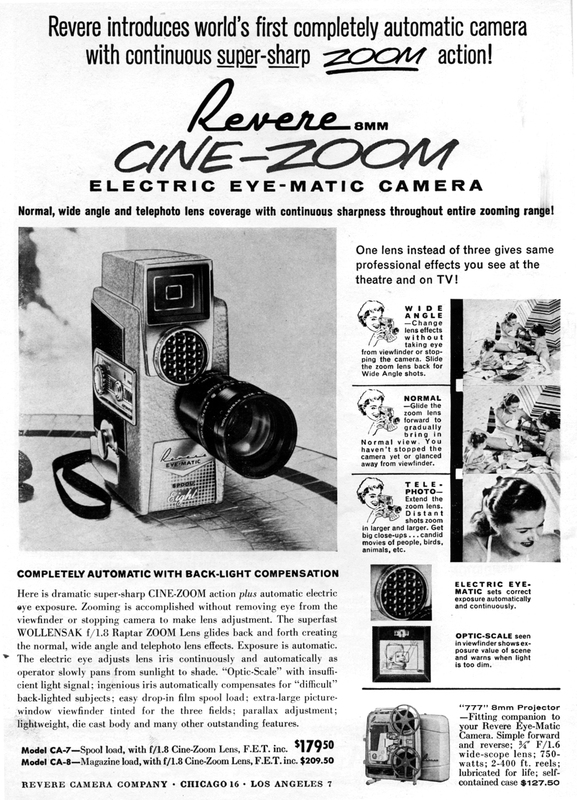 A special note about Revere's practices: for years they made cameras (e.g. the Revere 8) with the model number appended (e.g. 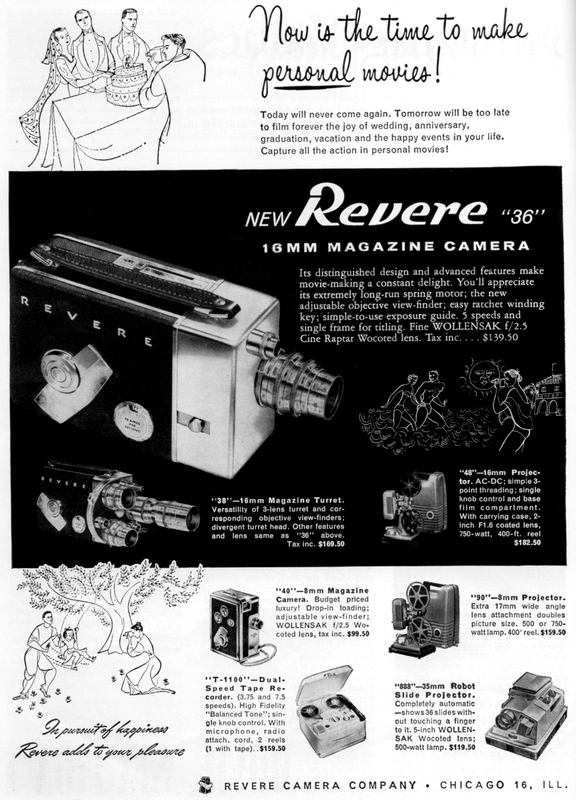 the Revere 8 Model 70), and then often referred to it in advertising by the model number in quotes (e.g. the "70"). For simplicity, I just list model numbers. Film Type: 8mm film was typically sold either as spools or magazines. 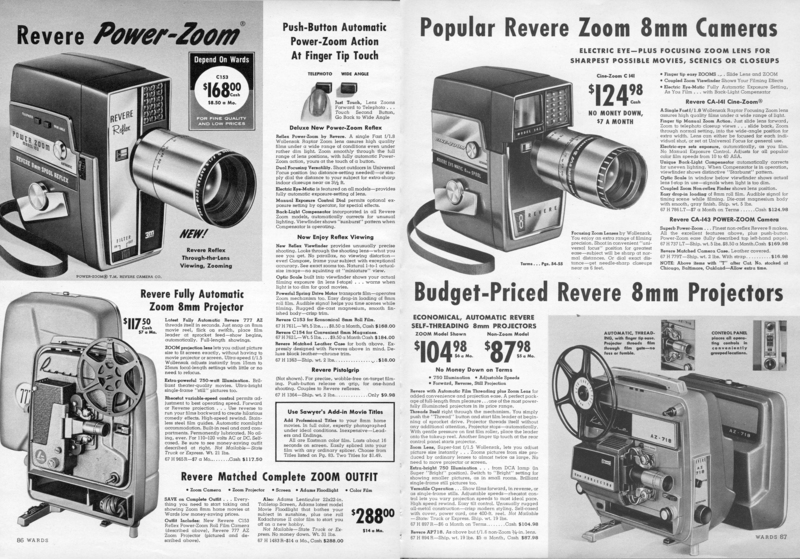 According to Kodak's history of Super 8mm Film, magazines of this era were labor-intensive and prone to jamming, and were more expensive than their spool counterparts. 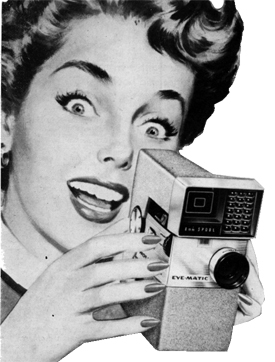 Camera-makers typically offered two versions of the same camera, identical except that one took spool film and the other magazines. The latter was typically more expensive. Both Revere and Wollensak often introduced identical models in pairs, one number apart (e.g. 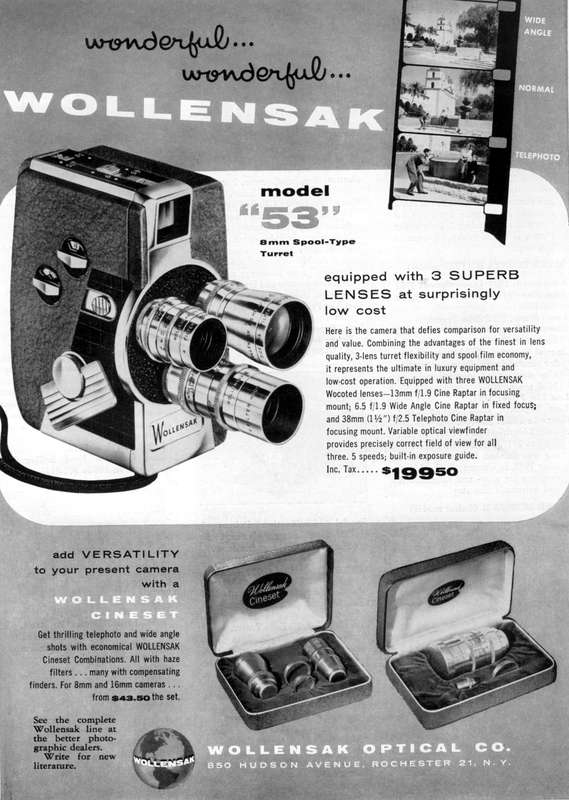 the Wollensak Models 43 and 44); the sole difference being that one model took magazines and the other spool film, or they had different stock lenses. Lens Type: Fixed means it has one lens permanently mounted. Turret means that there is a rotating mount with (usually) three lenses. 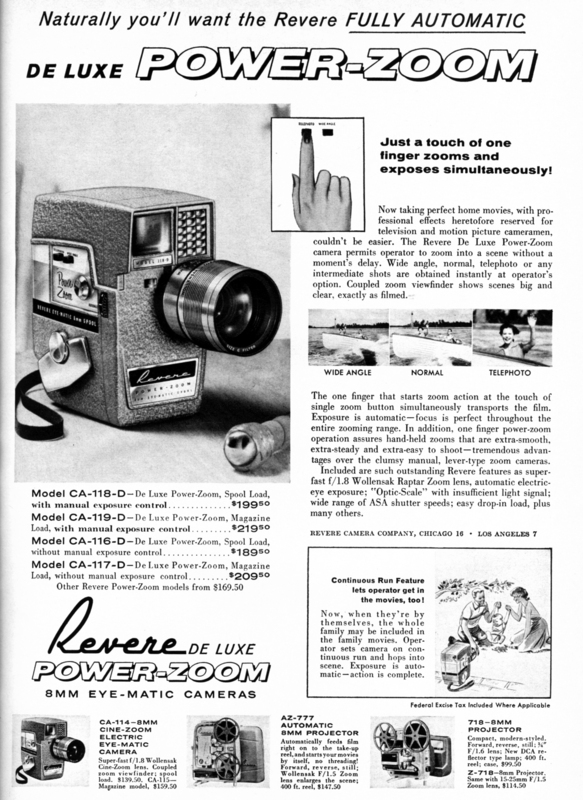 Note that many turret cameras were sold with only one; additional lenses were extra. Zoom means the lens had a variable focal range and was manually adjusted. Power Zoom is a zoom controlled by an electric motor. Lens: Focal lengths are given where known, but typically only max apertures were quoted in advertising specs. B&L stands for Bausch & Lomb; unnamed lenses are likely Wollensak. 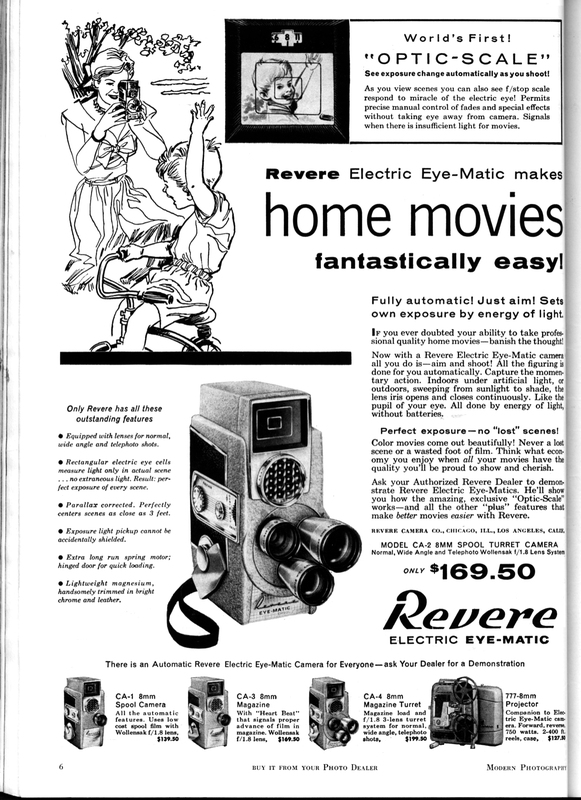 Exposure: Eye-matic was Revere's trademark for selenium-cell exposure control. 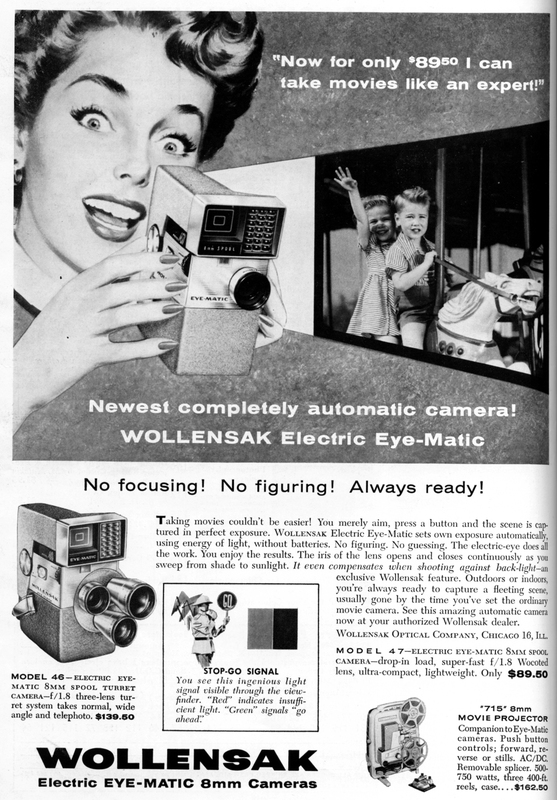 Many Eye-matic cameras were automatic-only; manual override cost extra, and is listed in the "other" column as a special feature. Focus: Fixed means the lens has "universal" focus and cannot be changed; it's also the least expensive. Variable means that the lens must be focused by the operator. 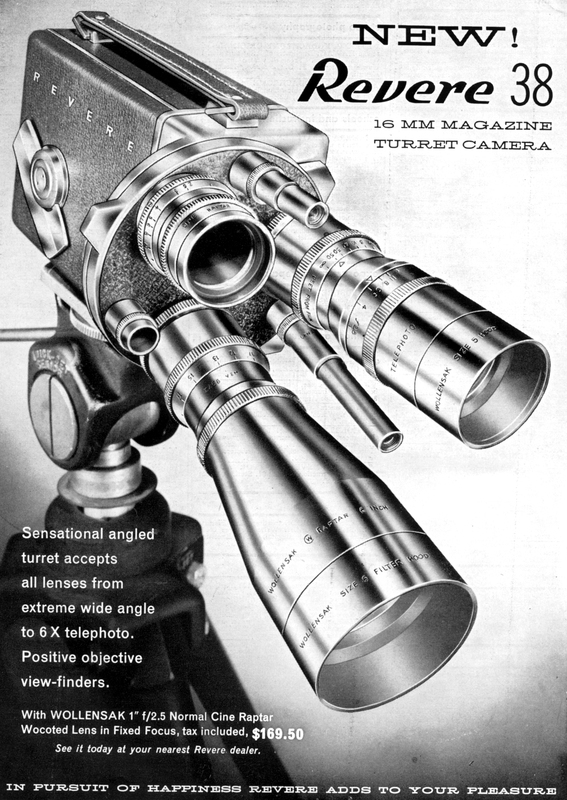 Note that on turret cameras, it is common to have one variable-focus lens (usually the tele) and the others are fixed. Docs: links to operator's/owner's manual. I have only included links where the models match up properly; however, you may find that many of the instruction manuals will be useful for close-cousin models. E.g. the Revere CA-3 and CA-4 are identical to the CA-1 and CA-2, with the sole exception that the former take magazines and the latter spools. The link to the CA-1/-2 manual won't be applicable for film handling, but would be applicable for everything else. Revere is one of those company's that's not well documented at all. The vast bulk of my information comes from manufacturer advertising. If you have more or better info, please feel free to drop me a line and let me know.